Design, Styling, & Events for your home & on the road! When I was pretty young, and my parents were too, they would load my brother and me into the car and take us on “roves”. Back then I just thought that meant a drive. My Dad frequently made up his own words that seemed like common language to me. Once I realized they weren’t I would check out words that our family used from time to time to see if they were real. When I checked out the actual definition of rove, a journey, especially one with no specific destination; an act of wandering, I loved it. To wander. Which is what we did on those drives. As kids, the highlight for us would be a stop at a lakeside viewpoint where we would throw rocks in the lake or a stop at 7-Eleven for Slurpees or maybe even the frozen yogurt shop. My mom has always been a house person. It’s in my blood! When we were on these roves we would typically drive around some pretty nice neighborhoods. If there was a house with large windows that we could easily see into then we would slow down to absorb all that we could exclaiming that it was an inside check out! If my brother and I saw one that my mom missed then we would be sure to let her know. Nowadays I love a good inside check out in any form. House tours, show houses, open houses….oh boy! A peek into anyone’s home is always fun, right? So I offer you some inside checks where I will welcome you inside my home and campers for your very own inside check out! I am hoping that the inside checkouts will grow and perhaps others will share theirs, so if you want to share your inside check out then please let me know! Now recruiting inside checkouts! Hey there! I'm Bree. 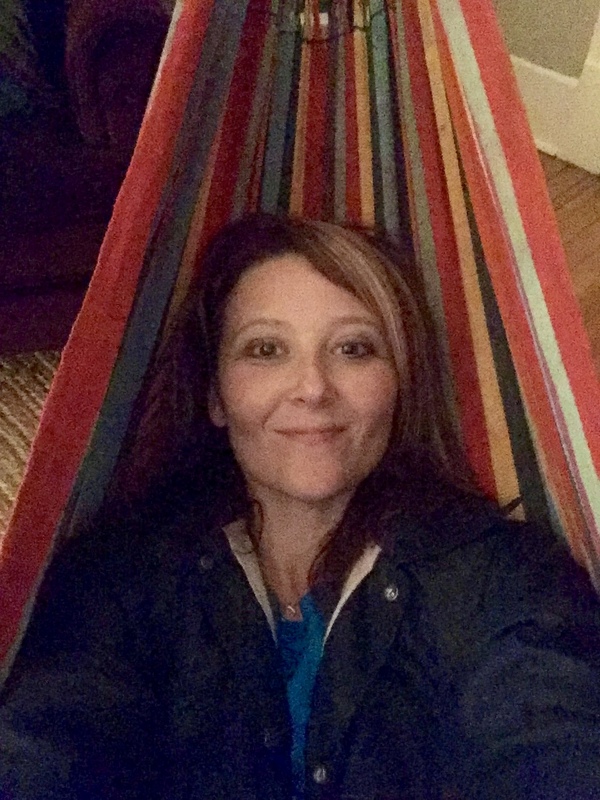 This is me in a hammock in my living room! Welcome to my space here, bringing together my love of interior design, entertaining, travel, crafts and a growing vintage trailer obsession! Let me help you connect with nature and create fun stylish new spaces, events, memories and experiences of your own as I share the stories, experiments, and mishaps about mine! © Copyright Five Rooms and an RV 2019. Theme by Bluchic.